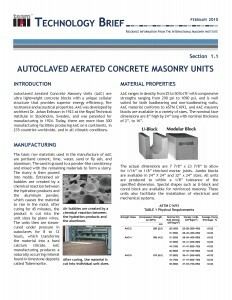 Autoclaved Aerated Concrete Masonry Units (AAC) are ultra lightweight concrete blocks with a unique cellular structure that provides superior energy efficiency, fire resistance and acoustical properties. AAC was developed by architect Dr. Johan Eriksson in 1923 at the Royal Technical Institute in Stockholm, Sweden, and was patented for manufacturing in 1924. Today, there are more than 300 manufacturing facilities producing AAC on 6 continents, in 235 countries worldwide, and in all climatic conditions. 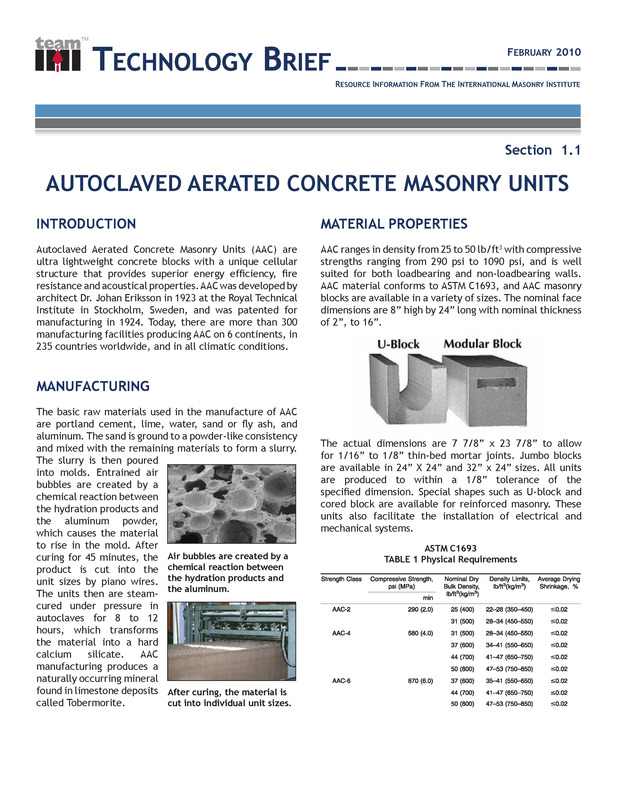 The basic raw materials used in the manufacture of AAC are portland cement, lime, water, sand or fly ash, and aluminum. The sand is ground to a powder-like consistency and mixed with the remaining materials to form a slurry. The slurry is then poured into molds. Entrained air bubbles are created by a chemical reaction between the hydration products and the aluminum powder, which causes the material to rise in the mold. After curing for 45 minutes, the product is cut into the unit sizes by piano wires. The units then are steam cured under pressure in autoclaves for 8 to 12 hours, which transforms the material into a hard calcium silicate. AAC manufacturing produces a naturally occurring mineral found in limestone deposits called Tobermorite….